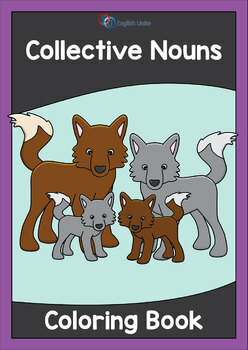 Coloring Book - Collective Nouns: An educational coloring book for children that creates a fun and exciting way to learn Collective Nouns. 1. A colony of ants. 2. A flock of birds. 3. A flock of sheep. 4. A gaggle of geese. 5. A herd of cattle. 6. A litter of kittens. 7. A pack of wolves. 8. A parliament of owls. 9. A pod of dolphins. 10. A pride of lions. 11. A school of fish. 12. A swarm of bees. 13. A tower of giraffes. 14. An array of hedgehogs. 15. A band of musicians. 16. A cast of actors. 17. A choir of singers. 18. A circle of friends. 19. A class of students. 20. A crew of sailors. 21. A flock of tourists. 22. A panel of experts. 23. A squad of police officers. 24. A team of players. 25. An army of soldiers. 26. An audience of listeners. 27. A block of flats. 28. A bunch of grapes. 29. A chain of islands. 30. A cloud of smoke. 31. A fleet of ships. 32. A flight of stairs. 33. A library of books. 34. A pack of cards. 35. A pair of socks. 36. A pile of rubbish. 37. A pocket of potatoes. 38. A range of mountains. 39. A set of rules. 40. A string of pearls. It is most suitable for children between the age of 6 - 10 years, but will also suit any child who loves coloring.